What would the world be like if there were only one type of mustache? It would certainly be a darker place than it is now. How would we tell the evil henchman from the heroic cowboy? How would we know the slimy business man from the ax-toting lumberjack? Not only would it be a world of confusion, just imagine the boredom! What's the point of facial hair without variation? Luckily we live in our world, a world which contains all sorts of glorious mustache madness. You don't even have to grow a wonderful mass of facial hair to stand out. 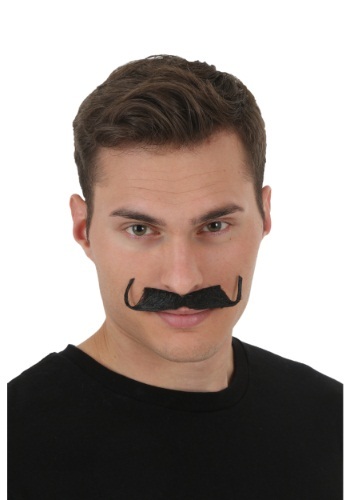 You can simply purchase a fake mustache to define your character. This classic handlebar mustache works perfectly for Wizard of Oz guards, munchkins, old west bankers, and sword fighting vengeance seekers. With this mustache, whatever your adventure throws at you, you'll face it with a stiff upper lip.